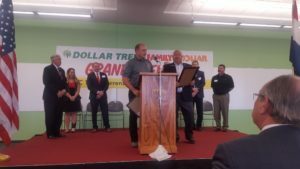 Dollar Tree says its new $110 million distribution center in western Missouri’s Warrensburg will create 375 new jobs by 2020. Governor Mike Parson (R) joined dozens of others at Wednesday’s ribbon-cutting ceremony in Warrensburg, which has about 19,000 residents. “And when you listen to these corporations, these companies, why did they decide to come to Missouri and they give you the reasons why, it’s those things that you can build on, when they start talking about work ethic, when they start talking about our communities,” Parson says. Governor Parson says Dollar Tree is a great addition to the region. State Sen. Denny Hoskins, R-Warrensburg, and State Rep. Glen Kolkmeyer, R-Odessa, presented Senate and House resolutions at the ceremony. 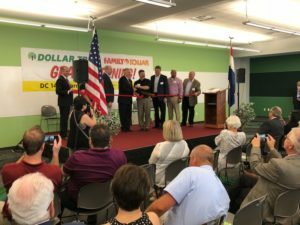 Missouri Department of Economic Development Business Development Unit Director Mark Stombaugh also attended the ceremony, along with Warrensburg Mayor Danielle Johnston. Virginia-based Dollar Tree says the Warrensburg distribution center will service stores across an 11-state region. Dollar Tree operates about 15,000 stores across 48 states. After Wednesday’s ribbon-cutting ceremony, Governor Parson traveled to nearby Odessa for a roundtable discussion with about 15 rural mayors. Parson says discussions like the roundtable are an important way to learn about concerns and areas that need improvement. Parson says the rural mayors he met with in Odessa are primarily focused on two main areas: infrastructure and workforce development. He says it’s imperative to continually work closely with local communities. Mayors who participated in the roundtable include Odessa Mayor Adam Couch, Cameron Mayor Darlene Breckenridge, Richmond Mayor Mike Wright and Warsaw Mayor Eddie Simons. The mayors also discussed the ten-cent gasoline tax increase that will appear on the November statewide ballot, along with rural broadband access. Governor Parson has also met recently with St. Louis Mayor Lyda Krewson and Kansas City Mayor Sly James. He says the infrastructure and workforce development issues that Krewson and James face is similar to that of rural Missouri mayors.